I didn’t fit in anywhere. My progressive, independent science-loving free thinking spirit had become spiritually flat, drained, and lifeless. The churches and groups with whom I had been involved were too conservative; too religious; too exclusive. So I went online trying to find if there was some church or group where I could feel I belonged, that didn’t claim to know the truth, and wasn’t exclusionary. So I drove to the 2014 Wild Goose. As soon as I hit the grounds, I knew I was in the right place. The people, the music, the speakers, Beer and Hymns—all confirmed that this is what I had been missing. This was what I’d been looking for, but had been unable to define. My defining Goose Moment that year came when I went to Reba Riley’s presentation: “Post-traumatic Church Syndrome.” Reba used a mirrored “disco ball” as a metaphor for people’s’ understanding of God. I heard her say, “Each of us sees a small bit of the reflected light, but no one of us grasps the entire scope of God’s essence.” For some reason, that hit me like a hurricane! It felt as if the heavy yoke of years of searching, struggling, and oppression were lifted. I was emotionally overwhelmed. 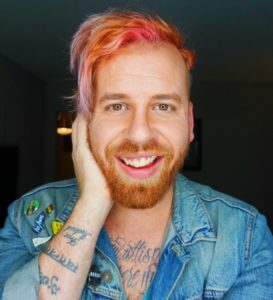 Then Reba said, “Now turn to someone next to you and talk about what this means for you.” I turned to the woman next to me and choked out: “I think you had better go first.” She looked me straight in the eye and said, “No—I think YOU need to go first.” At that I broke into tears and sobbed uncontrollably. The sense of being home at last was too overwhelming. I was unable to utter another word, but God bless her—that woman just sat with me and was present for me. I dearly wish I’d gotten her name. When I came home after that experience, I knew I was a different person, and I could not return to the church I had been attending with my wife. At the time, she was in Florida visiting a friend, so I decided to start church shopping. To this day I don’t remember how or why I chose the church I did, but that first choice was it. When I was sitting in the pew in that first service and heard the (female) pastor begin her prayer with: “Mother, Father God…” I knew I was where I belonged. I’ve been attending ever since. I felt I had to commemorate this life-changing experience somehow. In all my 61 years of existence, I never once had any desire whatsoever to get a tattoo. Now, however, I knew that was exactly what I needed. 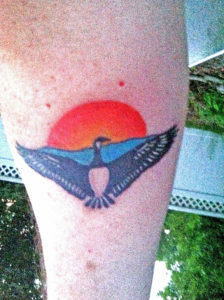 I now have the Wild Goose logo from that year on my forearm as a permanent reminder of my own personal burning-bush experience. Do you have a Goose tattoo? Tell us about it! May the Sacrament of the Word and the hunger of our hearts meet, leading us ever more deeply into your heart, O God. Amen. Having grown up in The Episcopal Church the most cherished memory I have as a child in the pew was hearing the sentence at the end of our Gospel reading today spoken/read during the service out of the 1928 Book of Common Prayer. I distinctly remember setting aside the weekly hang man game I was playing with my friend in the pew when the service neared that point in the liturgy in anticipation of the incredibly freeing and hopeful string of words. This is how it sounded to my youthful ears all those years ago. “Come unto me, all ye that travail and are heavy laden, and I will refresh you.” I can still feel the lightness in my heart and weight off my shoulders as those words of comfort washed over and through me. And so I’ve carried these particular verses as a touchstone throughout my life. I never totally understood the profound transformative effect they have had on me until rather recently. I mean, I knew they were restful and brought a deep sense of peace to my inner life. But it wasn’t until two years ago that it was literally made manifest in my life. It was in July of 2015, the first time I attended The Wild Goose Festival, a four day festival at the intersection of spirit, justice, music, and art, in Hot Springs, North Carolina. I was invited to be a panelist in a session titled Sacred Wounds: Healing from Spiritual Trauma. I was scared to death, for many reasons that summer, and I don’t mind letting people know that in the least. I had never participated in a national event before. I wasn’t sure anyone would be interested in what I had to say. I didn’t know how hundreds of festival attendees would react to me. My experience everywhere I went drew attention from people. And in those days it wasn’t positive attention. What I experienced upon my arrival at the festival was nothing short of transformative. The first thing I noticed was that those few hundred I thought that were going to attend was more like 5,000. And there wasn’t one single smirk or stare. No sideward glances or people pointing at me and saying something to their friend. It was so noticeable because of the absence of those things. For the first time in a long time I was accepted, no questions asked, and I felt absolutely safe in that space. As luck would have it my session was on the first day of the festival. That first evening I was introduced to an event called Beer and Hymns. Yes, it is pretty much exactly what it sounds like. People gathered and sang good old time Gospel hymns while having a beer. Well, most of them were gospel hymns. The one that drew me into the circle like a magnet was actually a song by U2 off of their Joshua Tree album titled I Still Haven’t Found What I’m Looking For. It is an amazing song, well gospel hymn. Listen to it if you haven’t heard it before. It’s a song about searching for God, searching for Christ. Later in the evening the Episcopal tent at the festival hosted the nightly Compline service. There were about 100 people gathered in a circle as we prayed. Lord, grant us a peaceful night and a perfect end. And then, those amazing peaceful transformative words, those particular verses that have been a touchstone for me throughout my life, washed over and through me like never before. I return to the Wild Goose Festival for a third year this coming week and I can already feel that lightness and peace. 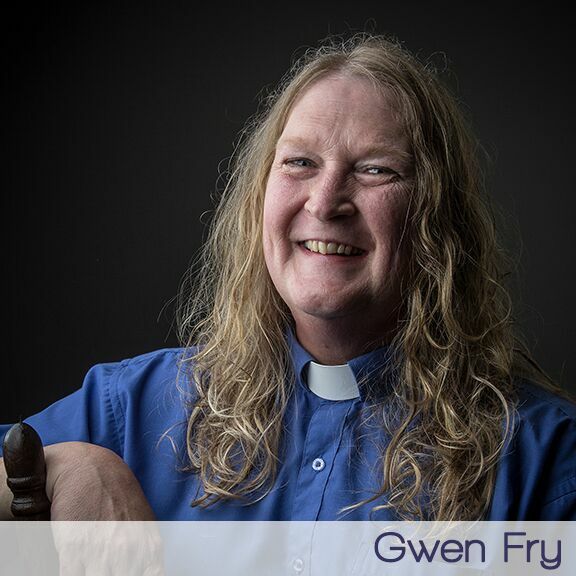 The Reverend Gwen Fry is an ordained Episcopal priest in the Diocese of Arkansas. Her experience coming out as a trans woman of faith makes her keenly aware of the necessity for the equality of all God’s children. Experiencing the effects of discrimination first hand, she has been actively involved in the work of justice in the transgender community both in Arkansas and across the Episcopal Church. Gwen is an advocate and activist for the transgender community who was a leader in the coalition of organizations who fought back the anti-transgender bills introduced in the Arkansas General Assembly this year. She is the Vice President of National Affairs for Integrity USA. She is a board member of Pridecorps, an LGBTQ youth center in Little Rock, Arkansas. An active member of TransEpiscopal, Gwen, also serves on its steering committee. When you read the word Ohio, what do you think of? You might think of cows and corn, or of a particular university which refers to itself as “The” university in Ohio. One summer afternoon I was sitting in a classroom on the campus of that university, listening to a young activist/historian lecture high students about colonialism. He was teaching about the violence necessary to wield power over an indigenous people in a foreign land and what it takes to mount a political and economic revolution against such a power. Suddenly, he said something that blew my mind. He explained that, when it comes right down to it, there are two basic economic resources: land and labor. As I reflected, it made sense. Of course, resources like food, water, clean air, shelter, and the care of others are critical to physical life, but land and work, and the connection between the two, are the stuff of economic development and power. Taking power over an established culture requires controlling its land and its labor. From our earliest sacred stories until now, land and labor have been in constant tension. In the beginning, God provided perfect land for humans. In fact, humans were made of the very humus of the Earth. As we rejected the self-sustaining, self-creating nature of God’s new world, and instead assumed control over it, we found the work harder than expected. In fact, working the land became a primary sentence for human Sin. In the sacred Hebrew stories, we find a people taken from their land and put to work building and serving foreign powers in Egypt, Assyria and elsewhere. And, in the American story, we find that very same thing; people separated from their land and forced to work for the benefit of a violent, profit-driven foreign power. Also a context for reconciliation and Reign. It is certainly true that land and work are the basic resources of exploitation for power and profit. But, it is also true that – when used in relationship with God and others – they are the resources for a flourishing community. They are the basic earthly ingredients for a new economy, for God’s will being done on Earth. For us, farming is at the center of a just world. Come and see. And, if you see justice in what we do, come and learn with us. For more information about MTSO and/or Seminary Hill Farm, visit MTSO.edu or SeminaryHillFarm.org. I spent the vast majority of Wild Goose feeling profoundly uncomfortable, and at the same time thrilled, inspired, and energized. I think that’s exactly how I should feel. From my post at the United Church of Christ hospitality tent, I was in a great position to meet people, because they’d come over to greet fellow UCC folk, or to ask what Queer Clergy Trading Cards are anyway, or, usually in the case of the children, to pick up free Starbursts. I loved talking to these people. I loved learning about where they were from, and what brought them to the Wild Goose. Most of them lived in places geographically far away from my small-town New England life, but in other ways we were often very much alike. We shared a common language. I could talk about being a beloved child of God without feeling like that person who just “made it weird” by bringing religion into the conversation, and I could talk about my passion for social justice without feeling like an “over-zealous” social justice warrior. Several of the worlds I usually find myself inhabiting separately merged together in those conversations, and in some ways, I was more comfortable and at home than I have been in a long time. At the same time, I was deeply uncomfortable, because my feet were killing me. I spent much of the weekend on my feet at the entrance of the tent, and by about midday on Friday I knew that my body was not going to forgive me for it any time soon. On Saturday we rearranged the tent so I could sit down instead, but for the most part I opted to stay on my feet. Mostly, this was because I felt that people would be more likely to come talk to me if I was standing, waiting for them, but I also felt somehow that my discomfort was part of the point. Should I really be comfortable in a place where so many hard conversations were happening, so many great ideas were being shared, so much of the future was being dreamed? If I stayed comfortable all weekend, it probably meant I wasn’t learning. I did leave my tent a few times, the first time to attend Stories and Mental Health workshop. Even giving my feet a rest, I was anything but comfortable. The stories I heard that morning were powerful, inspiring, and heartbreaking. They were stories that brought me into contact with experiences and viewpoints I rarely see, and at the same time they reminded me viscerally of my family’s own experiences with mental illness. Sitting in the back of that tent, I was close to tears, moved by the bravery and pain of those around me, even as I remembered my own pain. And this, I realized, is what the beginning of allyship feels like. When you listen to others, when you realize that their pain and experiences are not separate from yours, when you know that for you to be liberated, we all must be. And later, I attended Set the Captives Free: A Christian Call to End Mass Incarceration. Again, my body was comfortable but my mind was not. Anyone who can be comfortably listen to a discussion about how our criminal justice system targets, imprisons, and disenfranchises black and brown men and other groups is not truly listening. I found myself perched on the edge of my seat, not sure if I wanted to get up and run away from this truth, or rush towards the presenters and beg them to tell me how to dismantle this terrifying, pervasive system. And much to my surprise, they did tell me. They told us all that we can best fight this system when we combine political advocacy and policy work with real human connections and direct support to those who have been caught up in mass incarceration. Hearing these words, I breathed a sigh of relief, although I was still poised at the edge of my chair. “Okay,” I thought. “There’s something I can do. Now I just have to go and do it.” And this, I realized, is what social justice combined with faith feels like. A call to action, a heavy burden of truth, and a spark of hope in our own abilities. The last moment I would like to remember here is the end of the closing liturgy, where we all stood in a circle and held hands as we sang, “I am.” This, I know, is what community feels like. The circle, linking us all together, and our voices rising and falling together. Singing has always felt like community to me. When we sing together, we can hear that everyone has their own particular voice, their own place in the song, and we can feel that that is right and good. When I sang in that circle, I could hear some people singing the melody loud and proud, others adding sweet harmony, others just slightly off-key, others singing quietly but steadily, and I would be willing to bet that some people weren’t singing at all, but swaying and listening to the music around them with a smile. All of it—and I mean all of it—was right and good. There is no one right way to sing, just as there is no one right way to be a member of a community. And yes, I was uncomfortable, even as I sang. My feet still hurt, my face was slowly developing a sunburn, and the song was just a little too low to sing easily. And still I felt this was right. Sometimes, discomfort is purely negative and must be assuaged. But at other times, discomfort is productive. Sometimes, it pushes us to action. When I was singing in that circle, I didn’t want to leave and put on sunblock; I wanted to stay, singing, and add my own harmony. In the mass incarceration workshop, although part of me wanted to leave, I knew I couldn’t really hide from this; I wanted to do something about it. In the mental health workshop, I didn’t want to push away the presenters and the feelings brought on by their stories; I wanted to pull them closer and learn more. And standing in the UCC tent with my aching feet, I actually didn’t want to sit down; I wanted to run down the street, skipping and dancing, sharing my energy with the world and giving my feet something else to do. My hope for all of us, when we are far away from Wild Goose in this uncomfortable world, is that as often as we can, we choose not just to stand, but to run forward, through the discomfort, into our shared future. Bekah Anderson is a young writer studying religion and creative writing at Hampshire College in Amherst, MA. She is currently interning with the Congregational Assessment, Support, and Advancement department of the national office of the United Church of Christ. She hopes that the new, queerer church will have shorter job titles. Is your spirit still on the Wild Goose mountaintop? Are you still thinking about the new friends you made, the new ways you think about your faith and your purpose in life? Are you ready to go back next year? 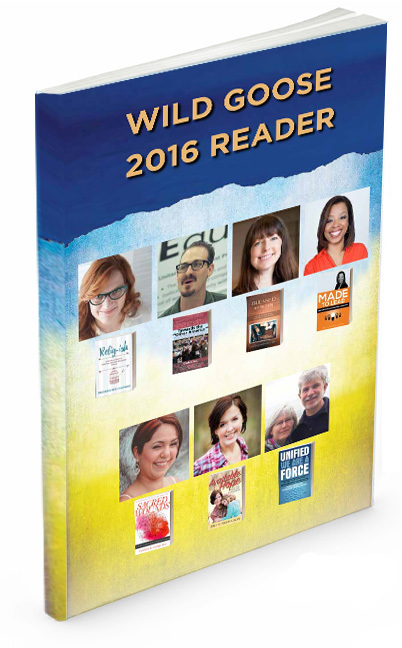 Go to chalicepress.net/WildGooseReader and find out how to receive your FREE copy of the Wild Goose 2016 Reader. The desert, the wind, the reeds, the river, the springs. Flocks from all over the region come for baptism. The Wild Goose descends upon the beloved Son. According to the Bible (John 1:28), the Holy Trinity – Father, Son and Wild Goose – was first revealed to mankind at Bethany-beyond-the Jordan, where John baptized his cousin Jesus. What did the crowds do? Could this have been the original Wild Goose Festival? 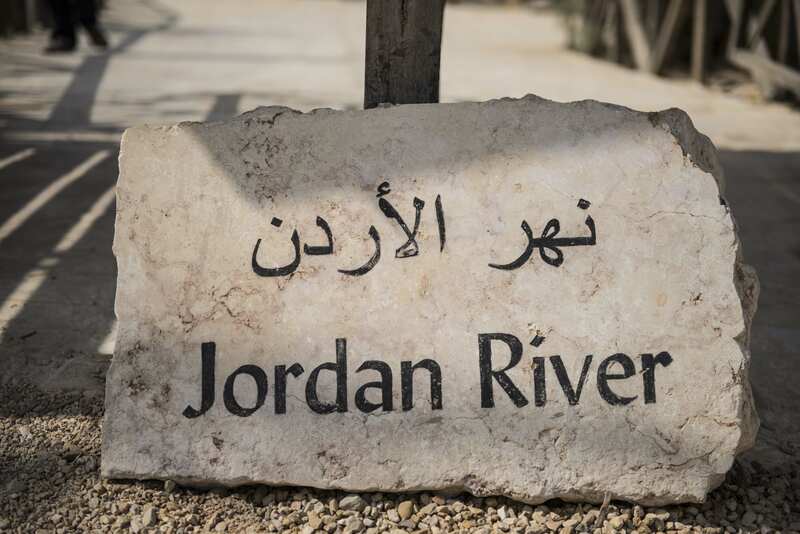 Jordan, the eastern part of the Holy Land, welcomes pilgrims from around the world to Bethany-beyond-the-Jordan, a UNESCO world heritage site. 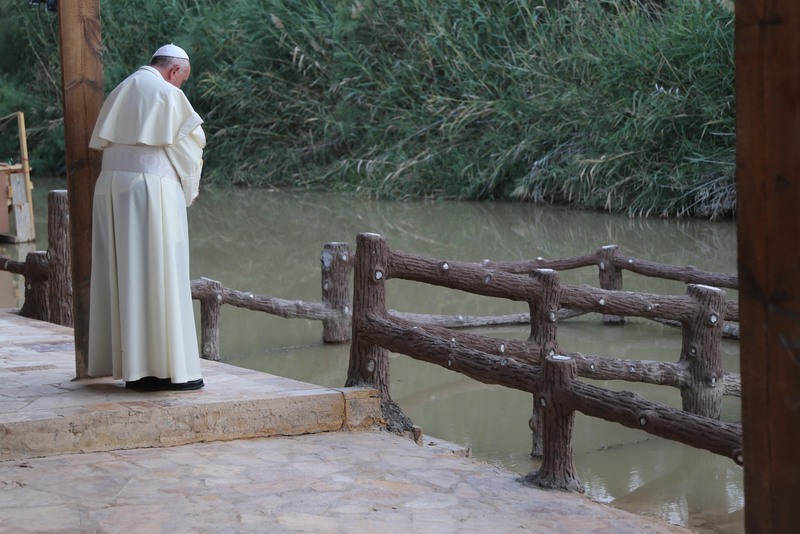 This special place of baptism – the Wilderness of the Goose – is one of many Old and New Testament locations in Jordan awaiting pilgrims who make the journey. I don’t make songs for free, I make them for freedom. God is inside you, all around you, and up above. Chance the Rapper and Sturgill Simpson are my musical go-tos during this season of life. Though stylistically different, they are both innovative storytellers who are laughing off the prescribed genres and archaic routes of professional artistry. To me, Wild Goose has taken a similar approach to spirituality—unafraid of the paradoxes that inherently come with stepping out of ascribed spiritual uniforms, belief structure, and religious norms. Rather than taking the easy path of embracing a cynical and iconoclastic spirit, Wild Goose holds the graced space of an open table for authentic seekers. What brings me back to Wild Goose? The Spirit of participants and presenters is real; I trust their underlying desire to lovingly impact the world through compassionate presence and engagement. It’s been a year or two since I set up my tent at Wild Goose, but I am looking forward to being back this go around as a part of the team from the Center for Action and Contemplation (CAC). We are proud to be a sponsor of the pre-festival Mystic Action Camp. Doubly proud to see three of our Living School graduates (Teresa Pasquale, Brie Stoner, and Holly Roach) as integral contributors to this offering. The most important word in our Center’s name is not Action nor is it Contemplation, but the word and. We need both action and contemplation to have a whole spiritual journey. It doesn’t matter which comes first; action may lead you to contemplation and contemplation may lead you to action. But finally, they need and feed each other. If being the and in action and contemplation sounds like your type of conjunction, we hope you’ll join us at Wild Goose to further deepen your contemplative engagement with our beloved world. See you soon. . . .
At the Sider Center we make a point of discussing topics your grandmother probably told you not to discuss, like sexuality, money, politics, and racism. We think we can talk about these potentially divisive things with love and respect, even if we disagree, because we value theological diversity as much as we do racial diversity. We don’t pretend to know the all the truth, but we know what love looks like. It looks like Jesus—bold and kind, creative and patient. And it’s to make the radical love of Jesus visible in this world that the Sider Center exists. Founded in 1973 by scholar-popularizer-activist Ronald J. Sider, ESA is the premier project of the Sider Center. ESA promotes peace with justice by educating and energizing the church through online publications (our blog, the weekly ePistle, study guides), hands-on training (such as our Racial Justice Institute), and speaking engagements. Because racial justice is so important to the Sider Center and to ESA, in 2016 we brought on Micky ScottBey Jones and Darren Calhoun as our Associate Fellows for Racial Justice. Micky and Darren focus ESA’s work on racial justice and reconciliation while leading our campaigns for racial justice and equality through social media, writing, and public actions. Our work is supported by Sider Scholars who work 10 hours per week at the Sider Center, receiving a scholarship for 50 percent of their tuition towards Palmer graduate programs, like the Master of Theological Studies in Christian Faith and Public Policy. Oriented to Love helps Christ-followers gather in loving, respectful dialogue around the topic of sexual and gender diversity in the church. Retreating to a place of beauty and rest for two days, together we discover a unity that is deeper than agreement. CreatureKind exists to engage churches in new ways of thinking about animals and Christian faith, with a special focus on farmed animal welfare. CreatureKind also helps churches play a leading role in animal theology and protection. The Sider Center partners with the Family Strengthening Network to provide Family Advocates in local churches and other organizations who can work with families on complex issues like employment, housing, childcare, financial management and counseling. In collaboration with Palmer Seminary, the Sider Center helped launch an online Spanish language master’s degree for educators and pastors in México City, México. This is one of the few graduate theological programs in Spanish that emphasizes women in leadership and holistic approaches to community transformation. On July 7, Evangelicals for Social Action will host a one-day Racial Justice Institute at the Wild Goose Festival to help participants reflect on, heal from, and discover creative ways to confront racism together. Please join us for this important and timely conversation. Even if you can’t make it, please be sure to stop by and introduce yourself! Throughout the festival, Sider Center staff will also be hosting workshops and conversations on animal welfare and how to communicate safely and lovingly around divisive issues in our faith communities.